Recently, Match-Maker Ventures and Arthur D. Little have released an interesting report, titled “The Age of Collaboration“. The study does a good job in synthesizing the global state of play of corporate-startup collaboration and latest findings on success requirements for its implementation. More and more corporations seek to engage with startups by pursuing corresponding activities across dedicated ecosystems and incorporating them in exploration units along with internal ventures. From an innovation perspective, the ultimate objective is to validate promising initiatives and selectively scale them up in order to adapt or even renew the existing core business. Startups, alike, show a rising interest in collaborating with corporations, rather than only trying to evolve under the umbrella of primarily value-oriented VCs. Without further ado I’d like to share some of the report’s key findings and visuals at a glance. I will also leave any comments from my side for a later point. For (worthwile) details, please delve into the report PDF. Engagement overall is very high – about 80% of startups and corporates have already collaborated or are collaborating. Corporates are most active in Corp-Ups (55%), followed by accelerators (45%) and CVC (41%). There are distinct differences by industry: Financial service corporates are leaning towards Corp-Up (63%), One-off events (56%) and CVC (38%), media players towards CVC (80%) and Corp-Up (60%), and telecoms towards Corp-Up (57%) and incubators/ accelerators (56%). Startup engaged naturally most in those vehicles not requiring any kind of equity. More than 6 out-of 10 startups have engaged in some form of Corp-Up versus 2.5 out-of 10 having engaged in a corporate accelerator/ incubator or 2.5 out-of 10 in CVC, which is still very high. A new approach is required: Corp-Up! Corporates like to own, but equity has an inherent issue: Instead of focusing on creating business impact for your customers, you are inclined to focus on valuation increase. This results in “free riders” on the equity side targeting the maximization of startup valuation within 5 years. Such results are easier to accomplish by playing around with P&L and balance sheets than dealing with actual customers, demand driven product development, and creation of actual revenues (“Corporate accelerators want to get rich on your equity, but you want customers.”). We are often receiving the question by corporates: “But aren’t you missing the upside?” as our business model is focused on a participation of the actual revenues generated as opposed to a valuation increase. Corporates often have issues with grasping this model, which is telling in and of itself. We often experience at corporates the fear of missing out (FOMO), which is so present that alternatives to “mine, mine, mine” are simply not pursued. The focus on equity can clearly be observed by the increasing activities of CVCs over the past years. Corporates are following a fundamental flaw in their own logic. The equity game is far more expensive and far from adhering to a key startup theme: “Trial fast, fail fast.” Once you are invested, you are committed and often your focus becomes blurred. Throughout the interview we increasingly experienced a rising frustration among corporates as neither the strategic investment nor the financial investment into startups starts to pay off. Likewise, startups start to realize that they are not at all set with their first large customer only because they were admitted to a corporate’s accelerator program or the like. 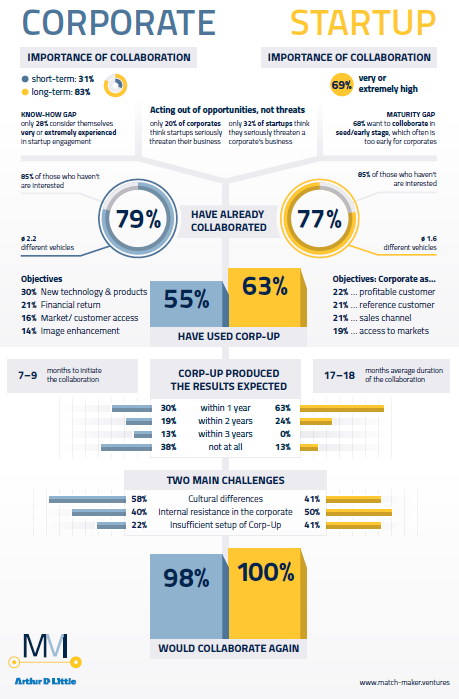 The equity “obsession” of corporates becomes even more surprising as the main objective across all vehicles clearly lies on “new products & technologies”: 30% of corporates state this is the key objective followed by market/ customer access with 16%. The question to be asked is, WHY do you need to own the startup? Corporates are not buying all their suppliers, but acknowledge that specialized companies are simply doing certain things better. The same should hold true for startups. It’s time to move to creating value for your customers and start focusing on Corp-Up engagements. Corp-Up encompasses a broad field, but an essential difference to other vehicles lies in the focus to create business impact for the existing operations. This can be in the form of a supplier relationship or by creating a joint venture. The Corp-Up can target to jointly launch a proposition (common in particular in the field of data analytics) or target the corporate directly as an end-user. You can differ the following Corp-up models (thanks to Nesta). I wonder what the situation would be if the people involved all learned science-based Integrative Thinking first to provide a common basis for communication and to stimulate Integrative Problem Solving? People are mostly educated in Critical Thinking which is “parts thinking” – the antithesis of the integrative thinking required for collaboration and creativity. Alternatively, as someone who works with new start-ups we’ve found the equity + support model can be really effective. Crowdsourcing cashflow and ‘fast-trialing’ new ideas certainly has its place, but for a more gradual and – dare I say it – thorough approach we’ve found nurturing innovation with a mixture of money and straightforward business advice can be a good thing. These days the importance of startup and corporations collaboration is huge. As startups need funding and corporations need to find new ways to innovate and progress. We can see that after analyzing corporations’ innovation strategies. We published an article about 100 Most Innovative Large Companies of 2018 that shows how all these companies try to find the right way to innovate. Such a great article! Great you are writing about the importance of collaboration between corporates and startups in order to find best innovation steps to growth! We wrote something similar. It may be interesting for you. Take a look at Corporate Innovation – Expert Roundtable #2. Thanks Lena – likewise! Great lineup and insightful takes. I’m particular happy to see Stefan Petzov whom I know personally!